The Feast of the Birth of Christ as a man is the capital of feasts, as Saint John Chrysostom says. All the other feasts of the Lord--Epiphany (Theophany), the Transfiguration, the Passion, the Cross, the Resurrection and the Ascension of Christ--follow from the Nativity. Without the Nativity there would have been no resurrection, but also without the Resurrection the purpose of the Divine Incarnation would not have been fulfilled. All the feasts of the Lord are unified. We separate them in order to celebrate them and to look more closely into their content. In every Divine Liturgy we live through all the events of the Divine Incarnation. Therefore, according to the Holy Fathers, it is always Christmas, always Pascha, always Pentecost. The Birth of Christ is a historical event, because it took place at a specific moment in history, when Caesar Augustus was Emperor of Rome and Herod was ruler of Judaea. The Evangelists insist on emphasizing the historicity of the event, because they want to say that Christ is a historical person. This means that Christ assumed real human flesh (Incarnation), and the Incarnation was not merely seeming or imagined. In spite of its historicity, this event remains a mystery. We know that the Godman, perfect God and perfect man, exists, but it remains a mystery how the Divine nature united with human nature in the person of the Logos/Word. Moreover, what happened to the Person of Christ, that the Divine nature was united hypostatically with human nature, happened just once. Therefore Saint John of Damaskos said that Christ is "the new thing under the sun". This means that since the creation of the world and man, nothing new has happened in the world. Everything is repeated. The birth of man is a consequence and result of God's words: "Let us make man in our image and likeness", and "Be fruitful and multiply; fill the earth and subdue it" (Genesis 1:26-28). The only new thing is the Godman Christ. Thus the fact that the event is historical does not remove the mystery, but also the mystery does not do away with the historicity. At Christmas we celebrate the birth of Christ, but at the same time we experience mysteriously in our hearts all the events connected with it, for when we are alive in the Church, we are participating in and experiencing all the stages of the Divine Incarnation. The difference between the Old and New Testaments is that all the revelations of God in the Old Testament are revelations of the Logos/Word without flesh, while in the New Testament they are revelations of the Logos/Word Incarnate. He Who revealed Himself to Moses and all the Prophets was the Son and Logos/Word of God without flesh, the Second Person of the Holy Trinity. The Prophets and the righteous men of the Old Testament not only had communion with the Logos/Word of God, but they also saw His Incarnation. This is the meaning of the fact that they saw Him as a man. Adam, as it says in the Old Testament, heard the footsteps of God Who was walking in Paradise. Jacob wrestled with God. Moses saw the back parts of God. Prophet Isaiah saw Him as a man sitting on a throne. Daniel saw Him as the likeness of a man and as a son of man coming to the Ancient of Days. All these revelations indicate that the saw the incarnation of the Second Person of the Holy Trinity, they saw Him Who was to become incarnate in order to save the human race. The fact that Moses saw the back parts of God indicates clearly that he saw what has to happen in the future, that is to say, the incarnation of the Logos/Word. The Prophets did not see God's nature, but the type and image of what was to become in the future. For the Son and Logos/Word of God was to become man in reality in order to be united with our nature and to be seen in the flesh on the earth (Saint John of Damascus). Apart from these cases there are also other apocalyptic texts in the Old Testament which prophesy clearly not only the incarnation of the Logos/Word of God, but also specific facts, such as that it would not destroy the Virginity of the Theotokos, that He would bring peace to the world, etc. In these analyses we are trying to look at the Christological meanings of the feasts of the Lord. However, we can also see several other facts which are connected with the truth that Christ is the Savior of the world and that the experience of this fact presupposes a particular spiritual state of man. 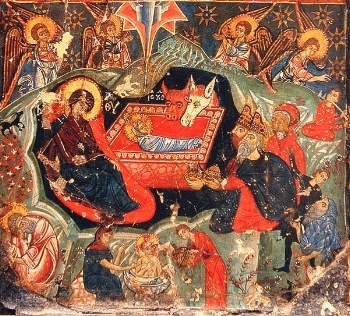 Apart from the Panagia (All-Holy Mother of God) and Joseph, the first to worship the Divine Child were the Shepherds. An Angel of the Lord made known to them that the Savior of the world had been born. This was not a chance event, it did not mean that the particular shepherds were worthy of this revelation because they were nearest Crypt. Please note: It is absolutely necessary that all Orthodox Christians understand the true meaning of the Birth of Christ, the Savior of the world. The Gentile or Secular world has made every effort to distort, dilute, and to diminish the authentic celebration of Christ's birth. We must never permit anyone to interfere with our Christian faith and to destroy the Christian salvific message of our Lord. For Orthodox Christians, Christmas, was never observed as a secular event, but a Sacred observance of the incarnation of our Lord and Savior Jesus Christ. It has never been about gifts or presents, but Christmas was one of the most holy days, a day of worship. I find it very offensive for an Orthodox Christian to place more importance of staying home on Christmas Day, then to be in church, to worship, praise, and offering thanksgiving to our Savior Jesus Christ for His infinite Divine Love. The true celebration of the Birth of our Savior cannot be replaced by staying home on Christmas day, to simply open presents, and eat breakfast. That is not how an Orthodox Christian honors the Almighty God and the Birth of His Only Begotten Son. Christmas is not about us but about the Savior of mankind. Instead, as Orthodox Christians we should be spiritually prepared to receive the Greatest Gift of all, Holy Communion. Have you noticed that all of the Major Christian Holy Days have been compromised, distorted, diluted, secularized, and undermined? We have permitted them to be changed from spiritual or religious observances, to materialistic, hedonistic, and worldly events. It is one of the reasons why they have lost their purpose and spiritual importance in our lives. It is all about entertainment, food and gifts. We, as Orthodox Christians, must never betray our Lord and Savior Jesus Christ or to ever consider betraying our Holy Church!